Seminyak is an upmarket suburb of exciting shopping, fine restaurants and entertainment, and Villa Bali Asri is a 3-minute walk to the hub of Seminyak down a peaceful country lane. The resort is a design blending modern and traditional elements, offering some of Bali's most exclusive rental accommodation. Villa Bali Asri is ideal for the discerning guest looking for a honeymoon villa, a family vacation or a romantic spot for lovers. The 11 luxury villas are made up of 5 x 1 bedroom, 3 x 2 bedrooms and 3 x 3 bedrooms villas, each with private swimming pool, secluded tropical garden. 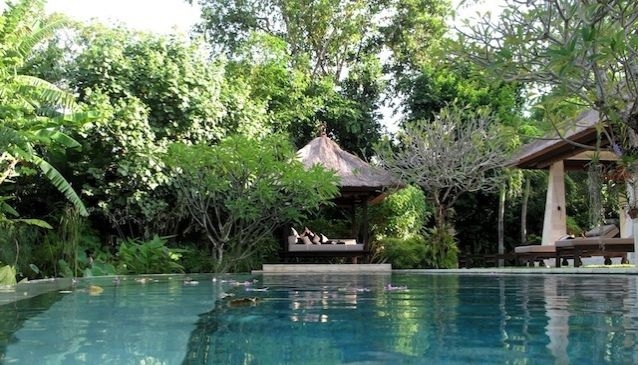 The Spa at Villa Bali Asri is heavenly. The design keeps the treatment space tranquil, but has a fully-equipped gym with ten machines to work out.